The long-tailed cuckoo is a migrant to New Zealand where they breed in our forest over the summer and then spend our winter in the Pacific Islands. From October on they can be heard but they are hard to see as they move quite swiftly, if you are lucky enough you might be able to see them on the tour. 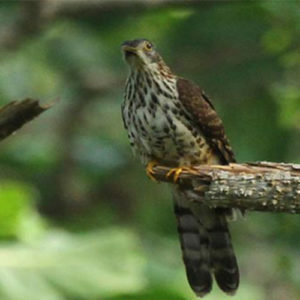 Click here to listen to the long-tailed cuckoo. Long-tailed cuckoos have their name because when they are flying you can see that their tail is as long as their large brown bodies. They are very vocal birds, they make a harsh screeching call when they are flying or when they are perched in trees. Long-tailed cuckoos sometimes fly over 4000km to NZ to lay their eggs in other birds nests so when the chick hatches, it tips out the eggs or chicks of the host bird and is then raised by the foster parents as their only baby. As they are large birds they can eat large prey which include skinks, geckos, eggs and other small birds. They mainly eat stick insects, weta, beetles and spiders. Canopy Tours are actively working to rid the Dansey Road Scenic Reserve of all pests to give our native animals a safe place to live. Learn more about Conservation at Canopy Tours here.